It's that time of year when we seek out big adventures. Often times big adventures mean a long journeys and many restaurant visits. 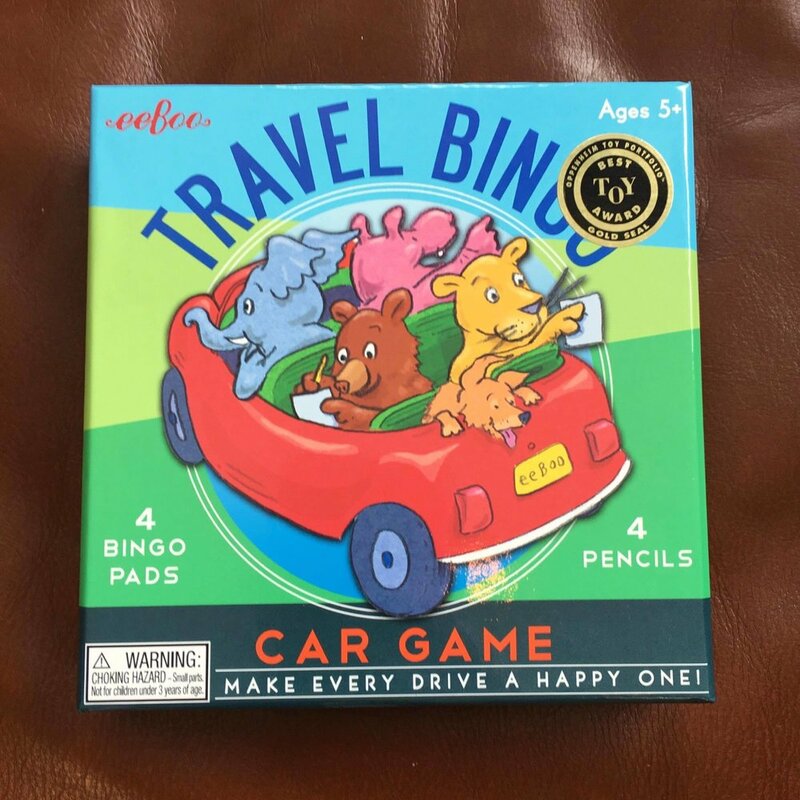 Keeping the kiddos entertained during travel & makes for a pleasant journey, so here at Little Village Toy & Book Shop we put together some things that might do the trick. All items are available in the shop! eeBoo Magnetic Games (6+): Choose between Fairy Checkers, Robot Checkers, Baseball & Chinese Checkers. eeBoo Magnetic Playground Scenes (6+): Choose between Volcano Island, Back To School, Fairytales & Robot's Landing. 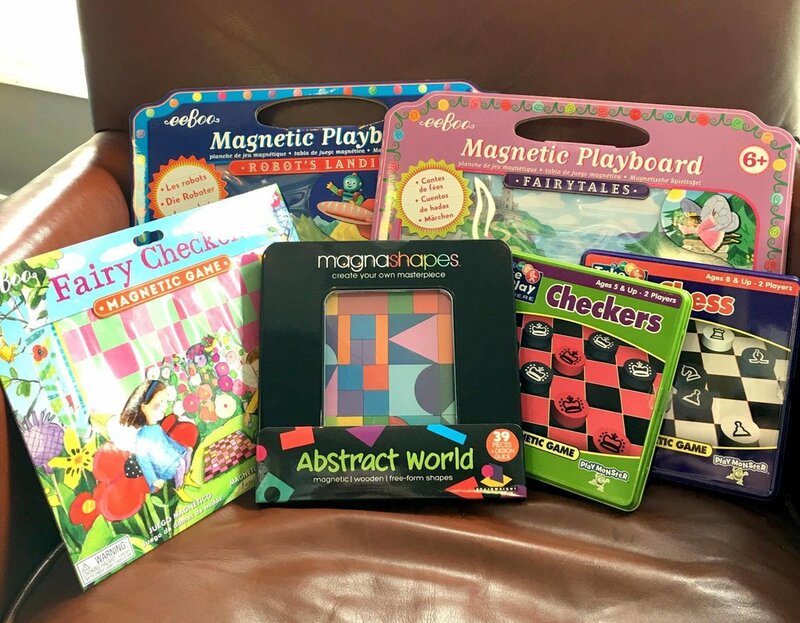 Magnashapes (8+): Magnetic wooden shapes stick right to the metal tin they come in. They also stick to any metal surface. Arrange the shapes to form an ulimited number of geometric patterns. Choose between Abstract Shapes, Squares or Circles. Each has 39 pieces and a colorful design guide. A favorite here at the shop! This comes with 4 Bingo pads and 4 mini pencils. The bingo pages have common objects seen during a car ride. Melissa & Doug Sticker Pads! Each pad comes with 5 scenes and hundreds of stickers. Choose between: Vehicles, My Town, Prehistoric, Faces, Fairies & Fruitville Scratch & Sniff. Travel Doodle Pro (3+): Doodle screen with attached stylus. You just swipe the level to clear the screen. Scribble 'n Play (4+): Doodle on the screen and touch a button to clear the screen. Lots of Boogie Board choices! All are cleared with a touch of a button. Comes with batteries that have a 7 year life span. Boogie Board flash cards: comes with math fact cards, letter tracing cards and drawing tracing cards. You just slide the cards into the back of the screen and trace away. 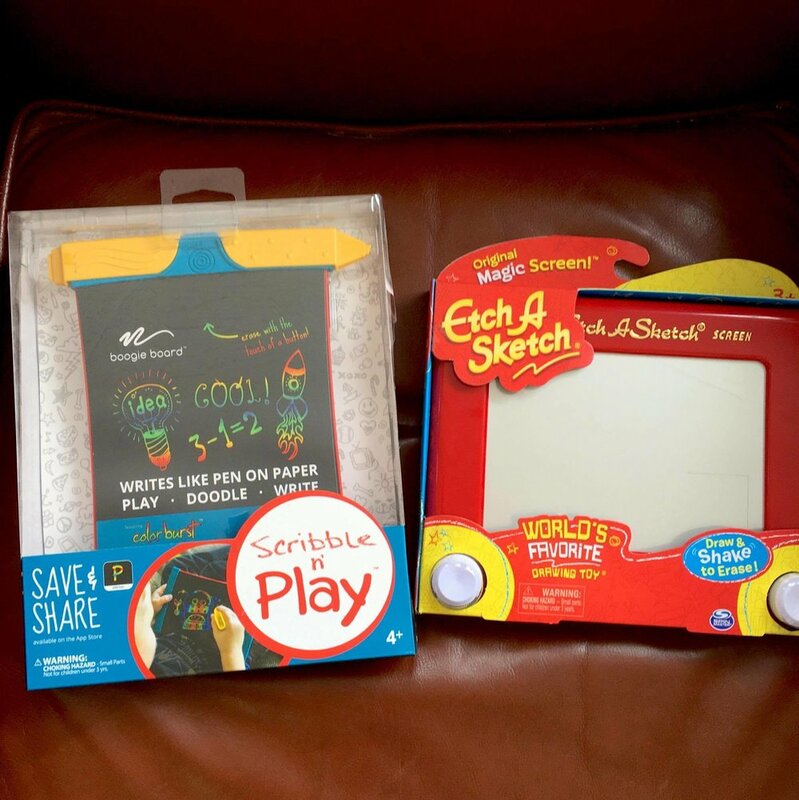 Magic Sketch (4+): Comes with texture drawing tools, a game plate, learning plates and drawing plates. It also comes with a screen cover. Just like the flashcards, you just slide the plates in the back and scribble away. We have MANY activity books at the shop, but here are a few to give you an idea of our assortment. DK Sticker Books (6+): Star Wars, Superman, Batman. Reusable stickers. Practice math facts anywhere. Choose between Addition/Subtraction & Multiplication/Division. Travel activity books for the younger crowd! Surprise Ink Game Book (5+): includes a color-changing marker with game pages. Surprise Ink Coloring Pages (3+): includes a color-changing marker with assorted dinosaur themed pictures. Magicolor Mess-Free Coloring Book (3+): includes coloring pages & 4 mess-free markers. The marker colors only appear on the magicolor paper- leaving your child and surroundings mess-free. Scribble Down Activity Packs (4+): Includes a scene and images on transfer paper. You take a pencil or coin and rub the image onto the scene. There are three scene choices: Farmyard Friends, Pirate Adventures & Wild Adventures. Origami Animal Travel Activity Set (6+): Includes 34 printed animal papers with fold marks and instructions for beginner, intermediate & advanced designs- making this a great choice for families with multiple age ranges. For the older kids (8+): Rubik's Cube, Peg game & Back Spin. Back Spin is a double-sided brainteaser with two halves that you twist to pass marbles from one side to the other. Your job is to scramble the colored marbles, then figure out how to get them back into their matching slots - on both sides. For the younger kids (5+): Melissa Doug's Memory Game. This memory game is made of wood and has tiles attached with elastics to ensure that are no loose pieces.